Tunnel kiln for the 'dry the glass. Modular oven carpentry medium - heavy with powder coating. Equipped with tow roller to support large volumes of weight. - Forced ventilation and ducted through a recycling system in the room. Optimal system in order to get quick results at low costs. Insulation of the oven by panels of insulating materials with a thickness of 40 mm. - Heating and ventilation duct to obtain a constant air pressure and circulation for wet gases. 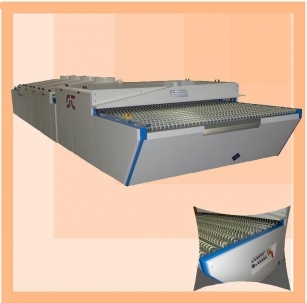 - Range of cooling for crystallization of the paint.